I purchased a Frigidaire Washer from BestBuy about 2 years ago for around $300. I was a bit hesitant to purchase this brand because consumer reports had mentioned that it was more likely than a few others to break down and need repairs, but the price was right and I was tired of heading to the laundry mat every week so I decided to go for it. It’s the first washer I’ve bought new and I’m happy to say I’ve had no problems with it this far and I have a way of picking out thing that tend to break down (I think its just my luck…haha). 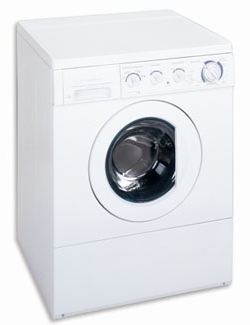 This model has enough cycles to keep me happy, its nice and quiet and it spins my clothes nice and dry. The only complaints I have about it (which are relatively minor) are that the plastic thing where you put the fabric softener get dirty quite easily and is pretty hard to clean, and the spinner thing in the middle has a groove at the bottom where the strings from my gym shorts and pantyhose get caught up and wrapped around everything else. I can’t for the life of me figure out why they didn’t make that thing solid, but I guess they may have some good reason.